This is plate fifteen of Robert Melville Grindlay's 'Scenery, Costumes and Architecture chiefly on the Western Side of India'. Grindlay (1786-1877) was only 17 when he arrived in India in 1803. He served with the Bombay Native Infantry from 1804 to 1820 and during this period made a large collection of sketches and drawings. Dambulla is situated about a mile from Kurrungalle, which was the principal British station on the district in Ceylon (Sri Lanka). These caves, the viharas, are situated approximately sixty miles north-east of Colombo. 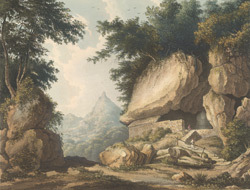 "Though inferior in size to the Viharas in Dambulla," wrote Grindlay, the vihara shown in the plate was "celebrated for containing a copy of the pretended impression of the foot" of the Buddha on Adam's Peak, seen in the distance. Grindlay quotes from a description by a Dr Davey of the religious rituals performed in the caves: "the united voices of at least one hundred men in the highest key of recitation ... made the caverns resound, and had a fine awful effect, producing a thrill through the system, and a feeling and sentiment not to be described." The dwellings of the priests were situated on the southern side of the rock below the vihara.